Today I picked up a copy of the stand alone expansion to ArmA 2, Operation Arrowhead. Bohemia Interactive now takes us to Takistan, a country that for all practical purposes looks pretty much like the other "stan". The past story of the country of Takistan is pretty much generic: a civil war in 1988 (the US backing the royalist faction and the USSR backing the socialists), the royalist faction prevailing after some fighting, all leading up to the uprising of the royalist tribesmen during April of 2012. On June 1st, 2012, Alliance forces deploy to Takistan after the socialist government of Takistan threatens to attack Karzeghistan ... blah, blah, blah. In case you are wondering, Borat is not playable. Operation Arrowhead packs more factions and units than in previous iterations of the franchise. The US Army, the Czech Republic, the Federal Republic of Germany, the Takistani Army, the Takistani Republican Militia, the Chernarussian Defense Force as UN forces and the Takistani people. The village of Shamali is suspiciously quiet this afternoon. I'm going to have lots of fun with this thing. I have been eyeing OA but have yet to crack the seal on ARMA2 which is sitting in my stack of "to play" games! I am looking forward to reading your impressions playing in the "stan". How is the AI and MP on the new expansion? Anything different there? @JayTac: Thanks for your comment. 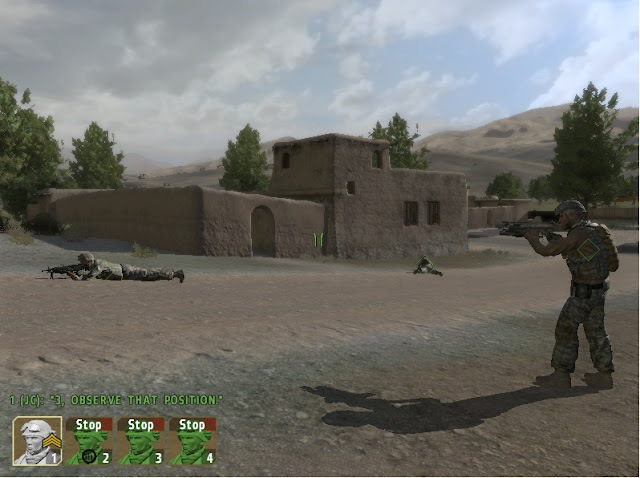 So far I haven't noticed any dramatic changes from ArmA 2. @JayTac: I was writing about the AI in my previous comment.